Grilled halloumi cheese is a gourmet trend that is quick and easy to make on your home barbecue grill. 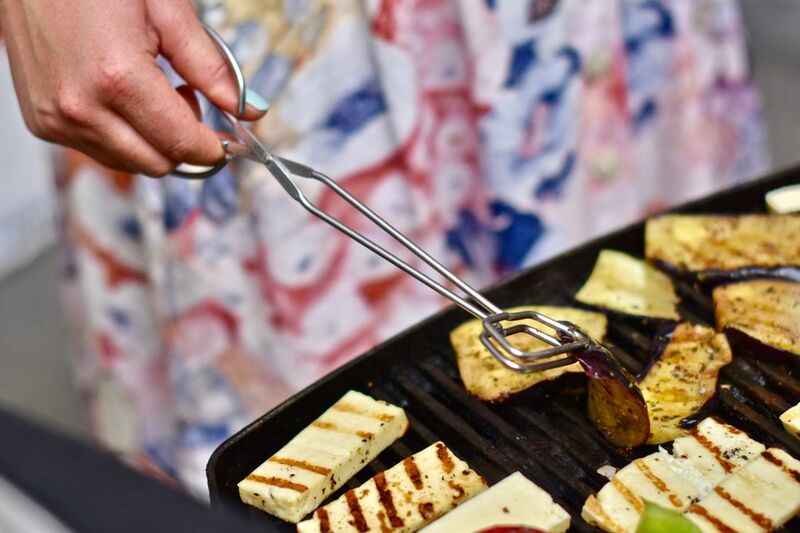 You can enjoy grilled halloumi slices or you can make it part of cheese and vegetable skewers. Halloumi cheese is traditionally made from sheep's milk on the Greek island of Cyprus. It is made without rennet so it is safe for vegetarians who avoid rennet. In the U.S. and Canada, similar cheese may be labeled halloumi-style or simply called grillable cheese. Halloumi has a higher melting point than you will find with most types of cheese, so it won't fall through the grates of your barbecue. You'll also get attractive grill marks on the cheese. Don't be tempted to take a bite of the fresh halloumi cheese just out of the package—it's a bit oddly textured and rubbery. It is brined, which adds saltiness and a greater depth of flavor than mozzarella (which has a similar texture). On the grill (or even just pan-fried in a skillet), halloumi cheese really comes alive and bursts with deliciousness. Pre-heat your indoor or outdoor grill to medium heat. Slice the halloumi cheese into wide, 1/2-inch thick slices and lightly brush each side with olive oil. Carefully place the cheese on the grill for just a few minutes on each side (about 2 to 3 minutes), until lightly browned and gently crisped; do not over-grill. Garnish the cheese slices with wedges of lemon or fresh herbs such as basil, mint, or oregano. Serve with grilled pita bread and enjoy! Halloumi cheese is best served immediately, while it is slightly crispy on the outside and soft and gooey on the inside. Halloumi is the perfect addition to your outdoor grill menu—whether you're cooking for vegetarians or just people who love good food (but particularly if you need some creative vegetarian grill ideas beyond just veggie burgers). You should be able to find halloumi at specialty grocers, including Whole Foods and Trader Joe's. If you can't find a local source for halloumi, you can buy halloumi at Amazon.com. You can also make smaller square 1/2-inch slices of halloumi cheese to thread onto skewers, alternating with vegetables such as bell pepper, cherry tomatoes, zucchini, and mushrooms. Brush the skewers with olive oil or your marinade of choice and grill them till the vegetables are softened, about five to 10 minutes, turning them every few minutes. Alternatively, you could make skewer of each vegetable and give the cheese its own skewer so you can ensure each is well-grilled but not overdone, then plate them together to serve. Grilled halloumi is delicious when served with sweet watermelon. You can serve cubes of grilled halloumi as part of a salad with watermelon or citrus fruit.